Enjoy Oahu Luau Entertainment! 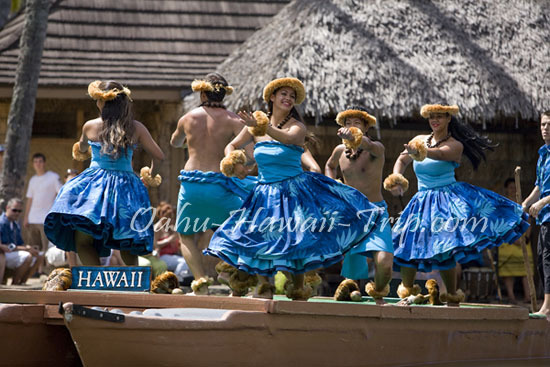 - If this is your first time in Oahu, you would not want to miss out on the famous Hawaiian luaus. 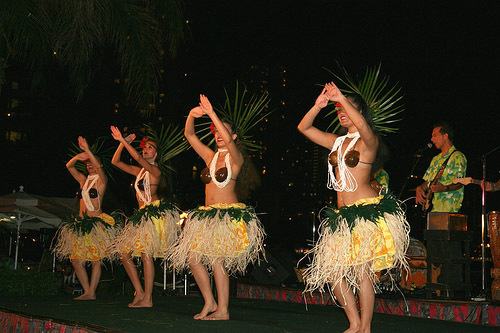 Oahu luaus are typically feasts featuring varieties of food, alcohol, Hawaiian music, and hula. The word "luau" originated sometime in the 1850s, and the festivity has, over the years, evolved into a spectacular celebration reflecting the cultural heritage of the Pacific Islands. It is enjoyed by both tourists and locals, and is a great way to meet new people and experience Old Hawaiian hospitality and entertainment. Here are some of the popular Oahu luaus that you could check out on your visit to this exotic island. Held on the sunny west side beach near Barber's Point Lighthouse, Germaine's luau has been acclaimed as one of the best luaus in America by America's Best 100. It is a backyard-style party where you can get together with friends and family to spend the evening with the perfect mix of food, drinks, and entertainment. The whole affair is very informal and you can just let your hair down and have a good time. The evening's entertainment features traditional ancient hulas, vibrant contemporary numbers, and a lot of fun activities to keep you occupied. 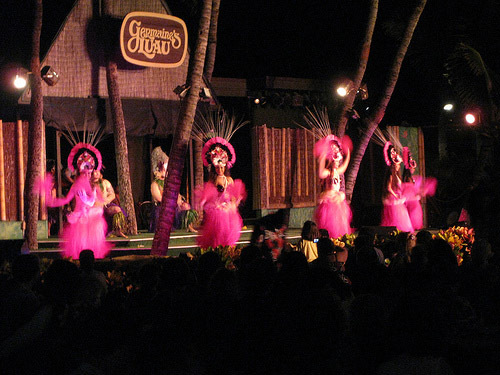 This luau boasts of superb entertainment in the midst of a spectacular setting. Located on 12 acres of ocean facing land in the Kapolei/ Ko'Olina Resort, the Paradise Cove luau will usher you in with live Hawaiian music and a traditional Mai Tai greeting. Take a walk through the village to discover the arts and crafts of the region, or pick up some net fishing techniques by participating in the nightly ceremony, Hukilau on the Beach. This Oahu luau also features a Royal Court procession, and the imu ceremony. You can take part in various Hawaiian games, or watch skilled tree climbers showering the white beach with a floral cascade from atop the tallest palm trees. 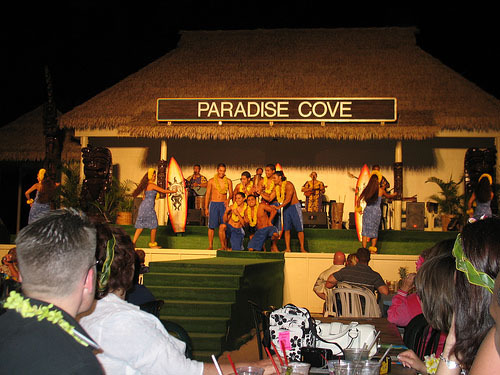 With plenty of pre-dinner activities including riding canoes and a fire knife dance, the Paradise Cove luau is bound to be a favorite with both adults and children. As the evening draws to a close, you can wind off by trying out traditional Hawaiian and continental cuisine to the accompaniment of breathtaking performances by the singers and dancers. Organized at the Polynesian Cultural Center, this Oahu luau is undoubtedly the grandest of them all. Named the most authentic luau of Hawaii by the Kahili Awards, the Ali'i Luau kicks off with a flower lei greeting. You can watch the elaborate process of traditional Hawaiian cooking in an underground oven during the imu ceremony. The entire extravaganza includes great Hawaiian music, hula, and authentic Hawaiian food. The only thing missing is the alcohol, and this might be a put-off for a lot of people. 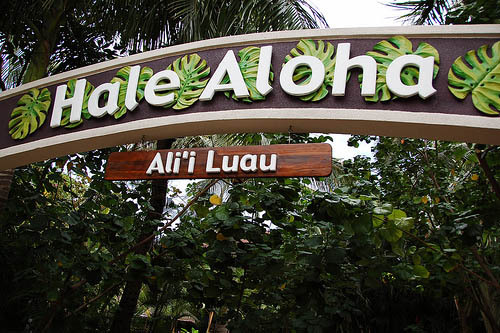 However, on the whole, Polynesian Cultural Center's Ali'i Luau is designed to give you a feel of the Polynesian and Hawaiian heritage and make your experience an unforgettable one. If you want to be at an elegant luau on Oahu Hawaii, this is one you should not miss. The Royal Hawaiian Luau promises the best of everything the island has to offer. Set against the crystal clear waters of the Diamond Head and Waikiki Beach, spend a starry evening surrounded by refreshing Mai Tais and Hawaiian melodies. The buffet includes exotic preparations of different kinds of meat and fish, as well as an assortment of salads and desserts. The highlight of the evening is the Royal Polynesian Extravaganza which offers you the chance to enjoy the music and dance of the Pacific Islands. This Oahu luau is organized only on Mondays. Share Your Oahu Luaus or Hawaii Vacation: We're looking for stories, tips and experiences from any Oahu vacation you've been on. Why not take a few moments and Share it with everyone!